Share "Breathe Easy With Houseplants"
Houseplants can be an amazing accent to your home, but the right houseplants are more than just living decorations or a way to bring a love of gardening indoors in all seasons. These popular plants can help clean the air in your home and create a fresher, healthier atmosphere for you and your family. With so many benefits of keeping houseplants, you will want to add a few green guests in every room of your home. 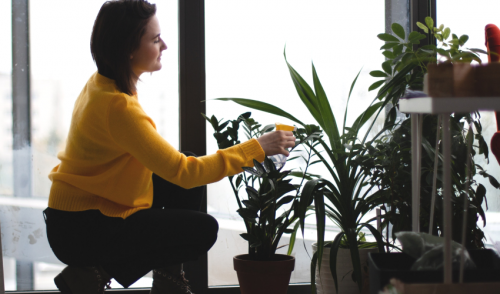 While these plants may have better documentation of their air-cleansing properties, any plant you enjoy will help improve air quality and enhance your living space. Understand Your Environment Before adding plants to your home, carefully evaluate the living environment you can provide to those plants. How many windows do you have, and how much natural sunlight is there? What temperatures do you prefer? Do you need to keep plants away from pets or small children to avoid toxicity if leaves or flowers are ingested? Once you understand your home habitat, you can choose plants that will adapt to your home more easily. The More the Merrier While any plant will help clean the air, it is recommended that you have at least two medium-sized houseplants for every 100 square feet of living space. This can add up to quite a few plants in one home, but you can focus your indoor growing efforts for the rooms that need the most air cleaning, including the bathroom and kitchen. Adding plants to the most frequently used rooms, such as a home office and bedrooms, is also a good way to maximize their benefits. Provide Proper Care A healthy plant will grow larger and produce more foliage that will increase its air-scrubbing capabilities. To keep your plants healthy, be sure they get adequate sunlight, proper soil for their nutritional needs and enough water to stay lush and hydrated. If you are a novice at keeping houseplants, opt for hardier varieties that don't mind a little neglect and are more forgiving if their care isn't optimal. Avoid Causing More Problems Even the most effective air-cleansing houseplants won't be helpful if improper care causes more problems than the plants can solve. Overwatering, for example, may lead to mold growth in the soil, or poor plant care could foster an insect invasion. Fortunately, taking proper care of your plants will minimize the risk of any inadvertent problems. Houseplants can be a wonderful addition to your home, not only because they are attractive ornaments, but also because they help create a healthier living space with cleaner air and fewer toxins. By understanding how plants can help you, which plants are best for atmospheric assistance and how to give your plants a good home, you'll make the most of the benefits those plants provide.